Seating for the cockpit for lounging, keeping an eye out for fish or for the big fight. Lacey loves the Sunbrella cushions. The upper back edge houses the welt or bead that slides into a PC of track mounted on the bulkhead. With this application, the tackle center lids can be opened with the cushions in place yet they are held stable. This is the perfect spot to watch the lures in our wake and know when to feed the line back to the Marlin. The cushion that Lacey is on is easily accessed from the entry steps. 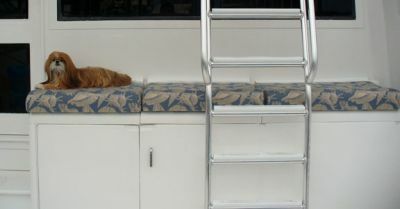 Using the bridge ladder gives use of the center cushion. 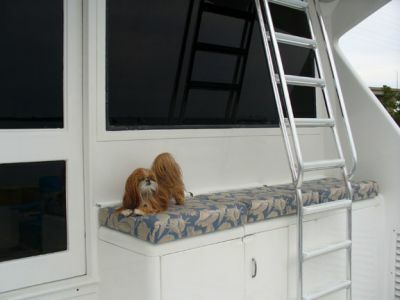 When we leave the dock, the step box is placed on the starboard side of the bridge ladder giving access to the last cushion.